The little girl with the blonde pigtails in the 'Big Otis' commercial played Markie in a Twilight Zone episode I really liked starring Janice Rule. Kellogg's OK's cereal was produced from about 1959 to about 1961. It was a type of sweetened Cheerios, with each piece in the shape of either an O ("for oats") or a K ("for Kellogg's"). 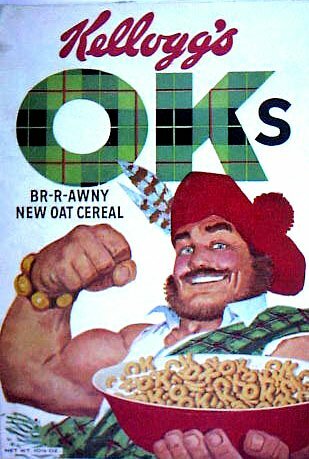 At first, the cereal was promoted with a Scottish theme, probably because oats have long been associated with Scotland. The packaging used tartan-colored letters, and the pitchman was a Scot known as "Big Otis." Starting in 1960, the Scottish angle was eliminated, and Yogi Bear became the pitchman. (The plaid OK on the box became solid black.) Yogi was chosen probably because Kellogg's was a sponsor of the Yogi Bear TV cartoon show. TV ads for OK's with both Big Otis and Yogi Bear may be found on YouTube.